↑ Poppinga, Simon; Weisskopf, Carmen; Westermeier, Anna Sophia; Masselter, Tom; Speck, Thomas (2016-01-01). 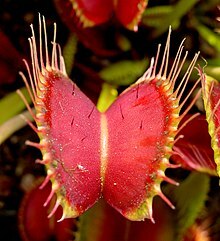 "Fastest predators in the plant kingdom: functional morphology and biomechanics of suction traps found in the largest genus of carnivorous plants". AoB PLANTS খণ্ড 8. doi:10.1093/aobpla/plv140. PMID 26602984. PMC 4717191. https://academic.oup.com/aobpla/article/doi/10.1093/aobpla/plv140/2609493/Fastest-predators-in-the-plant-kingdom-functional. ↑ Martone, Patrick T.; Boller, Michael; Burgert, Ingo; Dumais, Jacques; Edwards, Joan; Mach, Katharine; Rowe, Nick; Rueggeberg, Markus et al. (2010-11-01). "Mechanics without Muscle: Biomechanical Inspiration from the Plant World". Integrative and Comparative Biology খণ্ড 50 (5): 888–907. doi:10.1093/icb/icq122. ISSN 1540-7063. https://academic.oup.com/icb/article/50/5/888/644877/Mechanics-without-Muscle-Biomechanical-Inspiration. ↑ Forterre, Yoël (2013-11-01). "Slow, fast and furious: understanding the physics of plant movements". Journal of Experimental Botany খণ্ড 64 (15): 4745–4760. doi:10.1093/jxb/ert230. ISSN 0022-0957. https://academic.oup.com/jxb/article/64/15/4745/462045/Slow-fast-and-furious-understanding-the-physics-of. ↑ Matt Lavin (2001). "Fabaceae". Macmillan Reference USA. //www.novelguide.com/a/discover/plsc_02/plsc_02_00131.html. ↑ "Marantaceae in Flora of North America @". Efloras.org. //www.efloras.org/florataxon.aspx?flora_id=1&taxon_id=10535। আহৰণ কৰা হৈছে: 2011-07-18.